The trend in Mac compatible webcams is towards ever-higher resolution HD cameras. With Apple using Dual and Quad-Core processors often running well over 2Ghz+, many MacBooks, the Mac Pro, iMac and Mac mini desktops make ideal computers for HD video capture and online conferencing at high frame-rates. HD webcams supporting 2MP and higher sensor resolutions perform well with the CPU horsepower of current computers in the Apple Macintosh line. But be aware there are still some older Mac OSX video apps and web chat programs currently don't know how or aren't programmed to sense or support higher HD webcam resolutions and different 16:9 wide-screen aspect ratios. You also need a VERY FAST internet connection for smooth, high frame-rate HD webcam chat, streaming and conferencing online. Because of Logitech's committed support for Mac with their HD still image and video capture apps for OSX, these two UVC compliant web cameras in the $25-$75 price range offer the most functionality for Macintosh users on Intel Mac models at a bargain price. Yes, Microsoft makes quality, external webcams that are MacOS compatible. When Windows 7/Vista was released, UVC compatibility was now built into WinOS making the myriad of vendor and model-specific webcam drivers a thing of the past. Creative Labs had long supported MacOS by being one of the first camera manufacturers to standardize on UVC specifications. However, Creative recently discontinued most of their web camera line, and are now focusing primarily on audio hardware. The budget-priced 720p Live Cam Chat is the only model still generally available. Camera sensor resolutions are increasing rapidly. Much like the digital camera market, webcams have gone from 1MP to 3, 5, 8, and now over 10MP (megapixel) sensors. Logitech leads with it's 4K Ultra-HD Brio which supports resolutions up to 4096 x 2160 on very fast Macintosh models. It's necessary to have a fast USB 3.0 speed port to transmit such a large amound of data. Many older webcam programs for Mac only support traditional 3:4 aspect ratios at, say, 320x240 or 640x480 VGA resolution. At least that's what many Mac video and chat programs expected. More current Apple webcam programs know how to take advantage of higher 720p and 1080p HD Mac camera resolutions and their wider aspect ratios. The main benefit of an HD webcam is primarily for IMAGE CLARITY, LIGHT SENSITIVITY, AND DETAIL. The higher resultion sensor of a 2 megapixel and higher webcam makes it easy to see the superior detail, especially in HD webcams paired with top quality optical glass lenses. Apple compatible webcams are easier to find these days, but still tricky to identify. Not all video webcam manufacturers clearly label thier web cams as UVC - USB Video Class compliant on their retail packaging. UVC compatibility is CRITICAL for driver-free Mac OSX operation. UVC webcams are USB 2.0 speed devices ONLY, and not suitible for obsolete USB 1.1 port Macs! Basic UVC support is built into MacOS Mojave and Sierra as well as OSX Tiger, Leopard, Lion, Mavericks, Yosemite and El Capitan's bundled webcam driver. These provide BASIC compatibility with FaceTime HD, Skype, iChat AV, PhotoBooth, QuickTime video capture, ISPQ, Flash video chat and many other chat programs. They're ideal for Mac mini and Macintosh Pro desktop computers which lack a built-in iSight camera - or as a more versatile external USB webcam for MacBook laptops, or Mac Pro, Mini and iMac desktops. Fortunately, an increasing number of Mac programs have been revised to really take full advantage of HD webcam resolutions and wide-screen aspect ratios beyond 640x480 when video conferencing. You may have a Mac compatible HD webcam, enjoy the razor-sharp image, light sensitivity, and color-balance. But with some older programs, you'll still only be video-chatting at 320x240 or 640x480 VGA resolution at best. These are manageable resolutions and video sizes that your average internet connection can handle. Skype only operates in 720p high-quality mode only IF and WHEN the hardware and bandwidth can support it. QuickTime Player bundled with many versions of MacOS DOES support capturing QuickTime video at the higher 720p and 1080p resolutions. But don't be suprised if you find excruciatingly slow-frame rates when trying to capture video clips with QuickTime's "Maximum" setting. You may also find QuickTime capture varies from cam to cam as to how it handles difference between 3:4 and Wide-Screen 16:9 video aspect ratios when switching between QuickTime's "Medium-High-Maximum" modes. The C615 and C310 models are offically supported by Logitech's older Mac webcam driver and capture software. Although other recent Logitech cams are UVC compliant and provide basic webcam functionality under OSX 10.4.11 or higher. More recent models are currently an Apple user's best choice for more fully featured HD video capture and still image snapshot control. 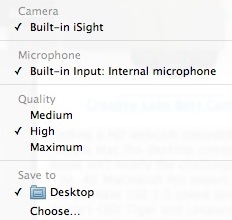 With the latest versions, Skype for Mac has finally added High-Definition webcam support for those who: 1. Have really high-speed internet access and, 2. Have HD capable external webcams or a more modern MacBook or iMac with with an iSightHD camera built in. That also includes the ThunderBolt Cinema Display with updated internal iSight HD abilities as well. 3. And optimally, H.264 compression to help make 720p mode more achievable. H.264 video compression tends to only be included in more premium models of Mac compatible HD webcams, most notably from Logitech or Creative Labs. Additionally, Apple's support of the maturing UVC 1.5 webcam specification helps HD webcam and video conferencing apps dynamically assess and manage available internet bandwidth, compression, and video frame rates so that users at each end of a video stream get the best Skype HD video chat experience possible - if the internet connection is fast enough. H.264 also helps reduce the size of files captured for YouTube uploads or video clips you upload elsewhere. OSX compatible Hi-Def cameras for personal online chat, business video conferencing and capture. Finding a Mac compatible HD webcam for Mac mini or an Apple Mac Pro desktop computer from Apple isn't nearly the challenge it used to be. All recent Macintosh desktops and MacBook laptops have USB 2.0/3.0 speed ports. With Apple's MacOS Mojave and Sierra as well as OSX ElCapitan, Yosemite, Mavericks, Lion, Leopard and Tiger, USB Video Class (UVC) web camera drivers are already in the OS. Any modern webcam that adheres to this UVC standard are simply driver-free plug and play on Apple computers. The Mac Pro and the Mac mini have three qualities making them ideal for HD webcam video capture, conferencing and online chat. These high-performance desktop Macintosh computer models have USB 3.0 or 2.0 speed ports, and fast multi-core processors. This allows them to achieve high webcam frame rates even at higher HD web camera resolutions. They're optimal for High-definition Mac video and chat uses. HD video chat on a Mac is more than just about camera resolution. Other factors such as your Mac's CPU horsepower, your internet bandwidth speeds, and the OSX video conferencing programs ability to detect and use hi-def, hi-rez 720p, 1080p and 4K 2160p webcam modes come into play.